Operation Toy Drop - Earning Irish Jump Wings While Helping a Great Cause! Some awesome pictures here thanks to the USAF photographers. 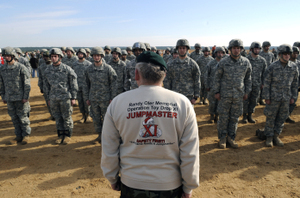 Had to post this one...because "even Santa needs a jumpmaster." 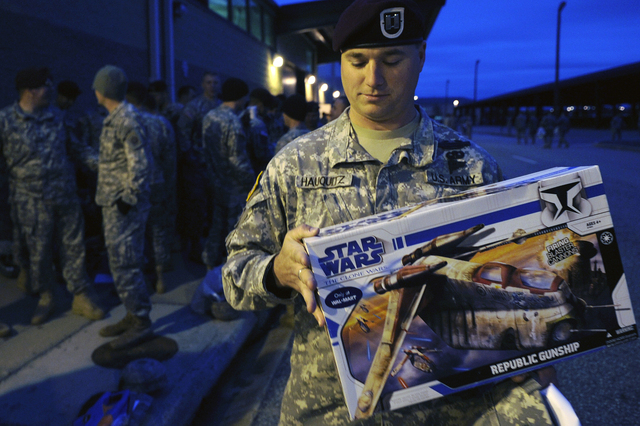 Operation Toy Drop is an annual airborne jump on Fort Bragg, N.C, hosted by the U.S. Army Civil Affairs and Psychological Operations Command, Airborne, and supported by Fort Bragg's XVIII Airborne Corps and Pope Air Force Base's 43rd Airlift Wing. Airlift support for the Randy Oler Memorial Operation Toy Drop was provided by the 440th Airlift Wing (AFRC) based at Pope AFB, NC, and the 145th Airlift Wing (NC ANG) based at Charlotte Douglas IAP, Charlotte, NC. 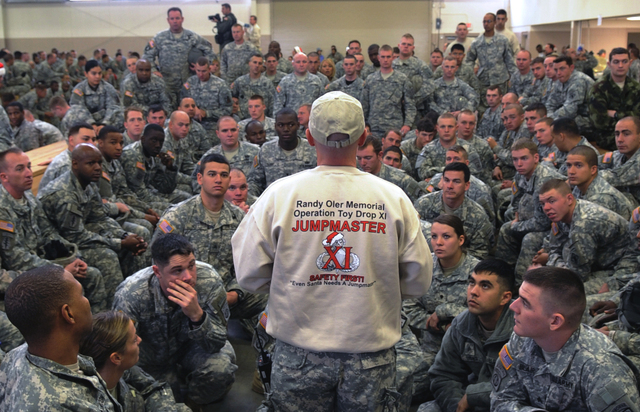 In support of the exercise, soldiers donate a toy for a lottery ticket giving them the chance to jump under a foreign jumpmaster to earn their foreign jump wings. U.S. Army Capt. Aron Hauquits waits to donate a toy during Operation Toy Drop on Pope Air Force Base, N.C., Dec. 5, 2008. Hauquits is assigned to the 4th Brigade Combat Team, 82nd Airborne Division. U.S. Army Sgt. 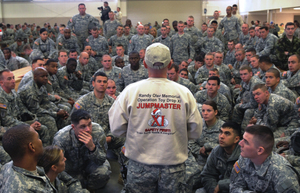 1st Class Jason McLoud gives a jump brief to a group of soldiers selected from an airborne jump lottery in support of Operation Toy Drop on Pope Air Force Base, N.C., Dec. 5, 2008. McLoud is assigned to Headquarters and Headquarters Company, Civil Affairs Team, Psychological Operations Command, 82nd Airborne Division, on Fort Bragg, N.C.
U.S. Air Force photo by Staff Sgt. DeNoris A. Mickle. A U.S. Army soldier assigned to the 82nd Airborne Division parachutes from a C-130 Hercules aircraft during Operation Toy Drop on Fort Bragg, N.C., Dec. 6, 2008. U.S. Army soldiers descend from an aircraft during Operation Toy Drop on Fort Bragg, N.C., Dec. 6, 2008. 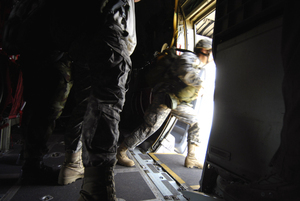 The soldiers are assigned to the 82nd Airborne Division. Operation Toy Drop is an annual airborne jump on Fort Bragg, N.C.
U.S. Air Force photo by Tech. Sgt. Jeremy Lock. 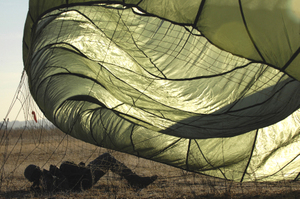 A U.S. Army soldier lands in a drop zone during Operation Toy Drop on Fort Bragg, N.C., Dec. 6, 2008. 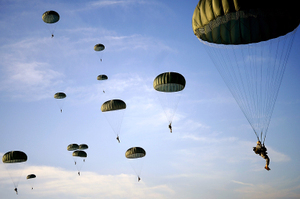 The soldiers are assigned to the 82nd Airborne Division. Operation Toy Drop is an annual airborne jump on Fort Bragg, N.C.
U.S. Air Force photo by Staff Sgt. Michael B. Keller. Irish Defense Force Sgt. Anthony MaGuire, a jumpmaster from the Army Ranger Wing, Curragh Camp, County Kildare, Ireland, prepares to award U.S. Army soldiers assigned to the 82nd Airborne Division, Fort Bragg, N.C., Irish army jump wings during Operation Toy Drop on Fort Bragg, N.C., Dec. 6, 2008.